The majority of countries in Africa have land that is over 1,500 m above sea level, and therefore classified as mountainous (UNEP 2014). East Africa is home to some of Africa’s most prominent mountains, including Mount Kilimanjaro, Rwenzori, Virunga, Kenya and Elgon, as well as highland regions such as the Ethiopian Highlands and the East Africa Arc. 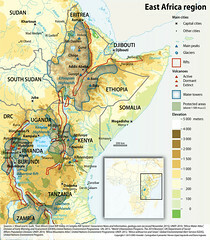 The Congo Nile Ridge,which runs from Bujumbura and southwestern Rwanda and stretches to the Northern Volcano Massif. The East Africa Rift Valley is also a major geological feature of East Africa. For any form of publication, please include the link to this page and give the creator credit (in this case Nieves Lopez Izquierdo) If the high-resolution file is not available, please contact grid@grida.no for request and permission for usage.